We’d love your help. Let us know what’s wrong with this preview of Goodnight, Seahorse by Carly Allen-Fletcher. A child's first introduction to creatures of the sea as a seahorse makes its way home to "bed." To ask other readers questions about Goodnight, Seahorse, please sign up. Goodnight Seahorse is a brief children’s book whose purpose is to introduce small children to creatures of the sea. It does exactly that with the most stunning illustrations I’ve seen. Carly Allen-Fletcher is a trained artist who used a multi-step process to “build” each vibrant page. I would buy her art in canvas or print form. It is breathtaking! I highly recommend this board book for its artistic and engaging content. Thank you to Carly Allen-Fletcher, Muddy Boots, and Netgalley for the copy. Goodnight, Seahorse by Carly Allen-Fletcher is a book I requested from NetGalley and the review is voluntary. I adored the few pictures but the very few words that are in there seem to be a very poor take on Goodnight Moon. It fails to make it. This charming book is the perfect introduction to creatures of the sea for wee ones. I love the rich deep colour pallet backdrop that accentuates the glowing golden little seahorse as he wearily journeys to his destination. The illustrations are whimsical and dreamlike making this book a perfect bedtime story. 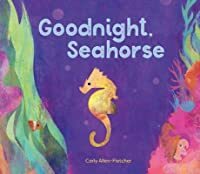 "Goodnight, Seahorse" is in board book format and includes a chart of different interesting animals that are found in the coral reef at the end of the story. I highly recommend this book. Thanks to NetGalley and publisher Muddy Boots for an ebook ARC of Goodnight, Seahorse by Carly Allen-Fletcher in exchange for an honest review. This book is about a child’s first introduction of creatures of the sea. Its about a seahorse making its way home to bed. I give this book a rating of 5 stars. It was a very cute and colourful book about the sea for children. My 4 year old daughter really liked the story. Some little ones are going to enjoy this little book! I bet even babies will enjoy hearing it! My Kindle only shows Black and while illustrations, but I'm betting they are very colorful and bright! They should be if they aren't! Lovely story of a little seahorse going home to bed and saying goodnight to all manner of sea creatures. Super cute! I a Kindle Arc in exchange for a fair review from Netgalley. Goodnight, Seahorse is a wonderfully, simple little book featuring all the brightly colored creatures that call the coral reef home. We move from page to page saying goodnight to each creature while getting a look at its habitat. This would be a perfect Storytime book and a great way to introduce young readers to these lovely sea creatures. The story is cute and the artwork is lovely. My daughter got excited about the mentioning of the wobbegong shark. I just wish it would have been longer. Thanks to Netgalley and the publisher for a copy of this book, which I voluntarily reviewed. A lovely good night book -- or anytime book -- for young children. The illustrations are vibrant and gorgeous, and the variety of sea creatures spans the familiar to the unheard of. The end of the book has a collection of creatures with their names. My one complaint is that it ended too early! This book has beautiful illustrations. It is similar to Goodnight Moon, which I love too. My kids loved this book and loved the different sea creatures that it introduces. Will make a cute gift to anyone having a baby. As seahorse swims home to bed he says goodnight to the other sea creatures on the coral reef. Fantastic illustrations. This bedtime board book follows a seahorse heading off to bed, saying good night to other ocean creatures along the way. The illustrations are vibrant and beautiful. This simple book is great for small children. I read a copy from the publisher via NetGalley. All opinions are my own. GOODNIGHT, SEAHORSE is a quick but beautiful way to introduce young ones to the animals of the sea. The art style is very Carle-esque, yet the book reads not unlike GOODNIGHT MOON. Each page shows another sea creature in their ocean bed, from octopuses who sleep on piles of pebbles, to the little seahorse who sleeps among coral. Very cute story! The pictures were beautiful and my 6 year old loved the story of the seahorse as he heads to bed. Great gift idea for anyone whose kiddos love the sea or sea animals. Unique, beautifully illustrated, it's going on my list for suggestions for birthday and Christmas gifts! I liked the illustrations in “Goodnight, Seahorse.” Overall, it was a cute book, but I didn’t like the mixing of fonts. What a sweet goodnight nook for young children. The book has excellent illustrations of sealife and presents it in a way to wind down a child's busy day. As a speech language pathologist, this is an excellent way to build language skills, turn taking skills, and vocabulary skills. I would recommend this book to all my parents of autistic and language delayed children to build in predictability to encourage verbal language. Love the illustrations. Buy this book and give it as a gift to expecting What a sweet goodnight nook for young children. The book has excellent illustrations of sealife and presents it in a way to wind down a child's busy day. As a speech language pathologist, this is an excellent way to build language skills, turn taking skills, and vocabulary skills. I would recommend this book to all my parents of autistic and language delayed children to build in predictability to encourage verbal language. Love the illustrations. Buy this book and give it as a gift to expecting mamas and papas! A big thank you to NetGalley and Rowman and Littlefield for the ARC.I am voluntarily reviewing this book. This is a cute story with nice graphics. Not many kids know some of the animals which will make it fun. Parents they may ask questions!! I rated this a 3.5. I think most small kids would enjoy the pictures. Through beautiful artwork, we follow Seahorse in her way home for the night. As she goes along, she wishes the critters she meets along the way a goodnight. From the expected octopus and squid, to the unusual wobbegong, we get treated to a variety of life to be found amongst the coral reefs. This is a great bedtime read for infants and toddlers. The pictures are soothing, with calming colours and shapes with softened edges. Recommended! ***Many thanks to Netgalley and Muddy Boots Books for provid Through beautiful artwork, we follow Seahorse in her way home for the night. As she goes along, she wishes the critters she meets along the way a goodnight. From the expected octopus and squid, to the unusual wobbegong, we get treated to a variety of life to be found amongst the coral reefs. This is a great bedtime read for infants and toddlers. The pictures are soothing, with calming colours and shapes with softened edges. Recommended! Carly Allen-Fletcher is a British freelance illustrator living and working in the Midlands. Her work explores the combination of digital painting and traditional media, creating images by layering graphic shapes with painted textures and handmade elements. She is inspired by nature, geometric forms, and interesting places. follow her on social media for behind-the-scenes looks at her work: https:// Carly Allen-Fletcher is a British freelance illustrator living and working in the Midlands. Her work explores the combination of digital painting and traditional media, creating images by layering graphic shapes with painted textures and handmade elements. She is inspired by nature, geometric forms, and interesting places.